The Fantauzzo, a hot new Brisbane hotel. 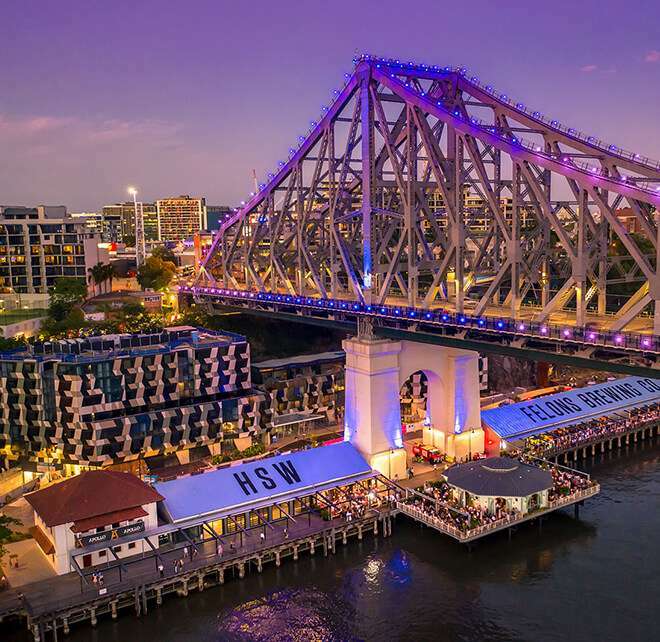 Once an underutilised site located beneath the Story Bridge in Brisbane, Howard Smith Wharves is now a bustling dining, drinking and entertainment precinct breathing new life into this unique Brisbane riverside location. Adding to the excitement is The Fantauzzo, a new boutique Art Series hotel inspired by renowned Australian artist Vincent Fantauzzo. The Fantauzzo is the newest Brisbane riverview hotel combining inspired architecture with contemporary luxury and the stunning artistry of Vincent Fantauzzo. One of the few five star hotels in Brisbane, you can expect the very best at The Fantauzzo. Become familiar with the works of Vincent Fantauzzo with a tour led by an in-house Art Advocate. Each corridor tells a particular story of Vincent’s career and focuses on the series of works which changed his life. In the lobby, you will find a selection of Vincent’s original artworks focusing on his passion about wildlife affected by global warming. In total, The Fantauzzo boasts over 210 varieties of artwork and 550 reprints, more than any other Art Series hotel, making it a true gallery. Relax at the rooftop swimming pool, grab a cocktail at the rooftop bar Fiume, work up a sweat in the gymnasium or check out all of the top Brisbane attractions in one of The Fantauzzo Alfa Romeos, Lekker bicycles or scooters, available for hire. Worked up an appetite? Head to Polpetta, located in The Fantauzzo, for authentic Italian fare. Carved into the cliff, this luxury Brisbane hotel’s suites and penthouses feature open-plan designs, contemporary interiors and are adorned with Fantauzzo’s most recognised works including three originals. Born in Birmingham, England in 1977, and moving to Australia in 1980, Vincent Fantauzzo is one of five children with a pastry chef father and an eccentric mother. Fantauzzo struggled through school with dyslexia before finding some direction in athletics, particularly boxing. He began painting sporting pictures and portraits of athletes. He went on to graduate from Royal Melbourne Institute of Technology with a Bachelor of Fine Arts in Painting and then completed his Masters of Fine Arts in 2005. He then won an artistic residency at St Vincent’s Hospital and in 2012 and RMIT honoured him as an Adjunct Professor. His portraitures include Aboriginal artists, actors like Heath Ledger and Asher Keddie, chef Matt Moran and former Prime Minister Julia Gillard. He has won the Art Gallery of New South Wales’ Packing Room prize and has been awarded the Archibald People’s Choice more than anyone else. Vincent Fantauzzo truly is an inspiration! Built in the 1930s alongside the construction of the Story Bridge, the Howard Smith Wharves project was initiated by the Queensland Government to provide relief work to locals during the depression. In the 1960s, the port moved downstream and the buildings were left abandoned. Because of its riverside location underneath the Story Bridge, the new Howard Smith Wharves precinct is extremely accessible. Hop on the free CityHopper ferry or one of the speedy CityCats for a cruisy journey along the Brisbane River, dropping you within 15 minutes of the precinct. Alternatively, you can take the city buses, train or park on-site. There is even a shuttle bus running between the precinct and the Teneriffe Ferry Terminal off Commercial Road and New Farm Ferry Terminal on Brunswick Street. It’s also an easy walk from the Brisbane CBD and popular Brisbane attractions including Queen Street Mall, Brisbane Powerhouse at New Farm, James Street shops, cafes and entertainment venues and numerous art galleries. From champagne toasts to craft beer to fresh fish and chips, Howard Smith Wharves is home to an array of top notch eating and drinking venues. Enjoy food truck parties, oysters on ice, Italian feasts and balmy evenings sipping cocktails on the rooftop as the sun sets behind the city. Planning an event? Choose from cutting-edge event spaces such as heritage-listed buildings, cliffside venues and green spaces. There are always plenty of exciting things to do at Howard Smith Wharves including free yoga and art installations. Stay at the hottest new Brisbane hotel. Opening special from $279* in a Studio including breakfast, $20 F&B credit and Wi-Fi. Book here. *Conditions apply. Valid for sale until 30 April 2019. Valid for travel from 26 March 2019 until 30 September 2019. Partnering up with the Helpmann Academy, supporting emerging creatives, The Watson recently sponsored the Academy’s People's Choice Awards. Abstract artist Jane Skeer was chosen as the winner with her sculpture 'Quiet Square' constructed from VHS reels.